Math can be hard, the fundamentals challenging, and other pursuits are easier and more fun. So why bother? The answer is because mathematics is an intrinsically beautiful subject. The study and practice of mathematics can raise your spirits, gladden your heart, and put a smile on your face. Simonson makes a remarkably sustained effort to substantiate this view. He devotes a big part of the Introduction to a conversation between a naive Reader and Professional who leads the Reader towards understanding and internalization of a sample problem, its solution, and the related probabilistic concepts. The problem is the well known "Birthday Paradox". Some educators may cry foul, "What? A solution to a problem is a starting point to a concept discussion! Handing out the goods before the Reader had a chance to play with the problem, experiment, turn it this way or that in his mind?!" Giving a solution right away seldom helps the student and might create a false feeling of understanding of the concepts involved. It is rightfully considered cognitive theft. But wait before passing judgement. Throughout the book, the problems - in mundane terms, but "challenges" in the book - immediately precede a solution. Superficially, the book consists of chapter or section introductions, problems and their solutions, with bridging intermissions, historical digressions, and extra explanations. Does it work? You bet! Simonson makes an exceptionally thoughtful approach within the imposed linearity constraints of book format. The gist of Simonson's approach is in selecting and sequencing the problems. As I mentioned, in the book the problems are referred to as challenges. I did not like that at first. But then I realized that there may have been a very good reason for the change in nomenclature. In a sequence of problems, an easier problem often follows a more difficult one, challenging the reader to affirm his grasp of the concepts or the methods just consumed. Sometimes, to the same end, a specific case follows a more general problem. This is a common practice in math textbooks to entreat the reader to stop and think, and to attempt solving problems before proceeding to their solutions; Simonson's book is no exception. But his style - perhaps perversely - actually attains the goal of forcing the reader to stop and ponder. I consider this an outstanding achievement. There is another facet to the book's approach. The selection of the topics is broad (arithmetic, algebra, geometry, probability) but not excessive; there are only 12 topical chapters in all. But the coverage of each is not only comprehensive, it is comprehensive in a peculiar way. Simonson builds up concepts by letting the reader observe their emergence from different angles and in different circumstances. For example, Chapter 7 on Euclid's algorithm starts with the Two Jugs problem followed by the sections on the algorithm proper, on methods of finding the greatest common divisor, the efficiency of algorithms, the Egyptian multiplication and the Fast Modular Exponentiation, e-commerce, cryptography, and the RSA algorithm. The definitions and the problem are set up in a context that helps form a concept and make it memorable. Finally, even though separate chapters are devoted to, roughly speaking, algebraic (clever calculation, sum of series, averages, games and gambling) and geometric (Pythagorean theorem, Euler's polyhedron formula, areas) topics, in the handling of the problems there is no such distinction. The book avoids flashy, colorful illustrations. Nonetheless, it resorts to visual reasoning wherever illustrations are called for, i.e., most of the time. The book is intended for teachers, in particular preservice teachers. It will be enjoyed by curious youngsters and math fans of all ages. The high price ($65), though, is a drawback. Books that useful and interesting should not be so expensive. 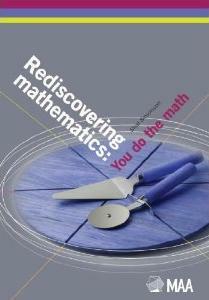 Rediscovering Mathematics: You Do the Math, by Shai Simonson. MAA (March 15, 2011). Hardcover, 207 pp, $64.95. ISBN 0883857707.